So remember when I told you to stock up on Jello Pumpkin Spice Pudding Mix? This is why. I used it to add pumpkin flavor to my fudge. It’s what I do. 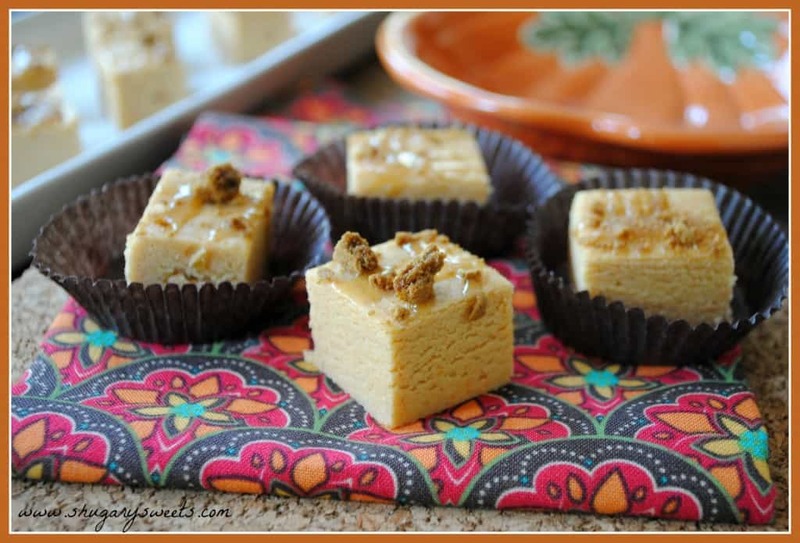 I’ve perfected how to make fudge in all flavors, including pumpkin spice. Fudge this good doesn’t last long around here! Usually because it’s SOOOOO good, I send it out of the house before I eat it all. That’s exactly what happened. Off it went to Michael’s work. I swear I’m not helping their wellness initiatives they may have put in place. Although, it does help me to not eat it all. So there’s that. Anyone else addicted to pumpkin this time of year? If you like this Pumpkin Spice Fudge recipe you may also enjoy…. 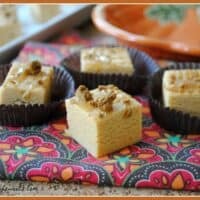 Pumpkin Spice Rice Krispie Treats– stock up on Jello instant pudding mix and make a batch of these krispie treats. Pumpkin Spice Biscotti– made with real pumpkin and possibly one of my favorite biscotti recipes! Pumpkin Spice Scones– move over Starbucks, you can now make these CopyCat scones at home! In large heavy saucepan, heat butter, cream, sugar and salt on medium high heat. Bring to a boil, stirring constantly. When it begins to boil, set timer for 5 minutes. Continue stirring while mixtures is at a rolling boil. Remove from heat. Quickly whisk in white chocolate, pudding mix and marshmallow creme. Whisk until fully blended (one to two minutes). Pour into a parchment paper lined 13x9 baking dish. Refrigerate 4 hours or overnight. Remove from pan, remove parchment paper, and place on large cutting board. Cut into bite sized pieces. In small bowl, whisk the caramel sauce and powdered sugar together. Drizzle over cut pieces of fudge and immediately sprinkle with crushed cookies. ENJOY immediately or store in covered container in refrigerator. You need to try this then!!! DO IT! I really believe that it was great! It looks so tempting! Oh that looks so good! I have heard of the pumpkin spice pudding and I need to get some this year! Speaking of not helping any wellness initiatives, I think there may be a drastic drop in the lives of everyone in my immediate proximity. These look delectable, and I can’t wait to give them a try…! You’re so greedy 🙂 Just me isn’t good enough??? haha! It’s creamy, smooth and delicious, and tastes like it all just came out of your mother’s kitchen. Pure heaven. I just love your fudge! 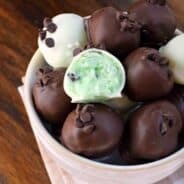 Have you ever thought of opening your own candy shop? You should!!! Hmmm. That sounds a lot like “work.” haha! Why yes, I think I am addicted to pumpkin. This looks like a fabulous way to satisfy the need for everything pumpkin right now – YUM! 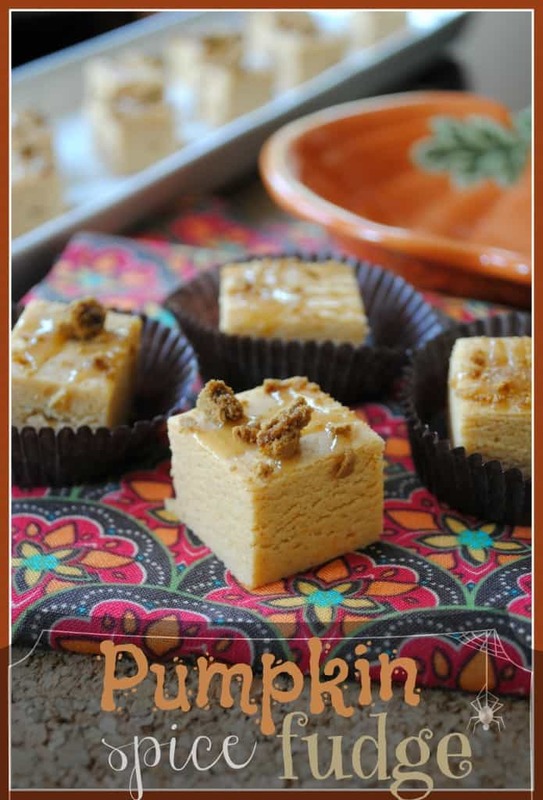 thanks for sharing this…lovin’ all things pumpkin!! Now I’m bummed that I used the box of pumpkin pudding mix that I had…I’d better go stock up, because this looks amazing. I love fudge (way too much, in fact). I love this whole idea, Aimee! Adding the pudding mix to the fudge is a great idea – i’ve seen it being added to cookies, but never to fudge! i haven’t tried pumpkin pudding – ever! what is wrong with me? I must buy some – even if I don’t make the pudding, I can throw it into FUDGE! What a great treat to bring to a halloween party! This sounds and looks incredible! And using the pumpkin spice pudding is genius. 🙂 We only have vanilla and chocolate pudding mixes over here. Seriously. And the caramel?! Yum. Mmmm, low in calories, I’m sure. I’ll be on the hunt for Pumpkin Spice pudding mix tomorrow. Walmart carries the pumpkin pudding but goes fast so stock up! These would be perfect for a fall party. They would probably be gone in 5 minutes flat. Beautiful photo! Outstanding! I am so excited for pumpkin desserts! This looks like fabulous fudge!! Love me some pumpkin. Glad you enjoyed it! Love homemade caramel sauce!! Hmmm, usually the number one reason for it not setting, is the mixture didn’t boil for the full amount of time. How firm is it? I’ve done this before with another flavor and stuck it in the freezer for an hour. Then removed it, rolled it in balls, froze again and dipped them in white chocolate. Truffles! Good luck! Thank you for your reply I tried to save it but there was no hope I think the problem was not getting the temp high enough …. 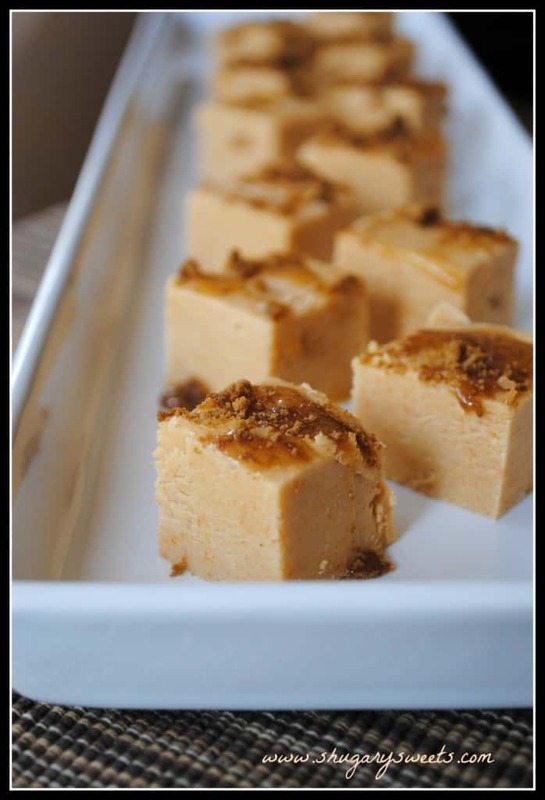 This was my first attempt at any type of fudge….I ended up finding a “no bake fudge recipe” more like cheesecake and I added pumpkin spice mix to it and it was a great hit …. I cannot get your Print function to work. I want save this recipe for the holidays. It looks yummy! Hmmm, just worked fine for me!? Every time I try it “Blank Page” comes up. Maybe it is me, but I can print elsewhere! Thanks for the response. I guess I will just jot the recipe down on paper ’cause I really like it. sorry I did not mean to send that first massage……anyway my fudge came out tasting grainy like you could taste the sugar granules, I boiled it for the 5 minutes like it called for, is that how its supposed to be? if not for that I would have been quite happy with it, just a little to sweet for me I think I would use 1 cup sugar and not 1 and a 1/2. 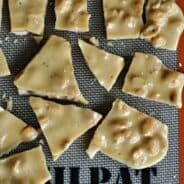 gave some to my husband and he really liked it, I didn’t say anything about it being grainy to him, so I’m not sure if that’s how it is or if I messed up. Does anyone know how long this fudge keeps? I have made it two weeks in advance! 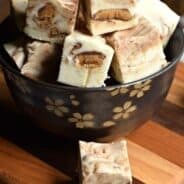 Pingback: Butterscotch Fudge Bites | Appetite Deluxe!